Off-Road Racing is a sport that evolves with the advancement of new technologies as the need for increased safety standards emerges. Bikes and Quads now use mandatory amber lights, helmets use more modern materials making them stronger and lighter and neck restraints are already mandatory in short course racing. The latest step into the future is IRC’s proximity sensor the “Pass Alert”. Let’s look at the problem before we explain the solution. In desert racing, race cars are started in :30 or :60 second intervals and travel at a high rate of speed over loose gravel and sand. Every vehicle leaves a cloud of dust that the next competitor must drive through in order to overtake the racer in front. The closer one approaches the slower vehicle, the thicker the dust may get. Every vehicle is equipped with a rear facing amber colored floodlight that is somewhat visible through the dust. The amber light solves part of the visibility issue. It lets the approaching race car see that someone is a few feet or inches ahead. If the amber light bounces or suddenly stops its a good indication the lead vehicle slowed down, went over an obstacle, or stopped. However the lead car never realizes that someone is right behind them and they are about to get passed. Off-Road racers have developed the system of knocking on the rear bumper to let slower drivers know that they’re behind and wanting to pass. This practice called “nerfing” a competitor however often leaves one party unhappy. There are also obvious dangers associated with this practice; Safety and potential vehicle damage. Now that we all understand the challenge, lets look at a new solution. 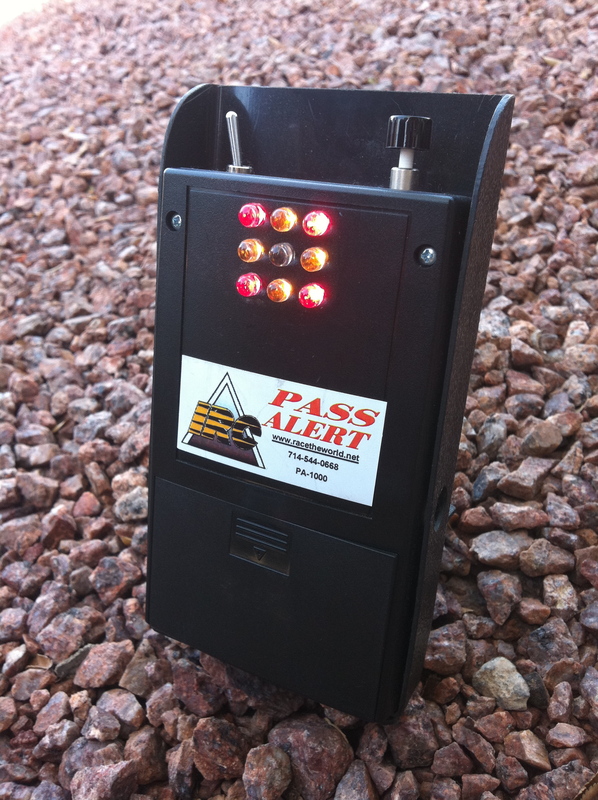 The IRC Pass Alert is a small device, the size and shape of a garage opener. It’s battery powered by a common 9V battery, has 2 switches, and a multi-color LED light array. It signals the vehicle ahead via radio frequency that you are behind them, are faster, and about to pass. The vehicle in front will have its LED’s flash yellow and may take action to let you pass. The signal range is limited to approximately 100 yards, so it wont interfere with the racer 2-miles ahead; it also travels only in the forward or backwards direction intended. If you signal to a vehicle in front of you, then a racer behind you will not falsely receive your “intent to pass” signal. In addition to the yellow “passing” signal the unit can also be turned into a “man down” status. In this mode any approaching unit will be alerted with a red LED signal. Race promoters may also send out a “green” signal to alert of special zones. This could be used to signal upcoming restricted speed zones, pit areas, or checkpoints. The IRC device works similar to the French Sintenel used at the A.S.O. Dakar Rally, but is a totally new design tailored to the needs of North American desert racing. IRC field tested the device at the last Best in the Desert Vegas to Reno race between the top Trick Trucks and some selected Bikes and Quads. The device is still in a field testing phase and pending feedback from racers will soon undergo production. Steve Meyers told us that the expected price point should be less then $200 per unit, but that depends on what the final device design will be like. This technology is not the silver bullet to make racing 100% safe but its one of many options that will get us closer. We hope to see this device become mandatory with every race organization.